In the Settings menu, you’ll see three different tabs, allowing you to configure your Workspace, your Stylus, and your Gestures. In the Workspace tab, you can configure your canvas experience. The first option in this menu is the Background. Concepts offers you nine different backgrounds, including basic paper types with subtle textures, transparent, blueprint and darkprint. We also give you the option to create a custom color background. The second feature on the menu is your Grid type. There are four grid types to choose from: Dot grid, 10/100, 16/64 and Isometric. To learn more, see Grid. Next up is the Artboard Size. If you want to create a certain sized drawing, this is the place to set your boundaries. You can use one of the presets Concepts offers or create a custom-sized artboard - just tap+hold on the size to enter the values. We offer four shortcuts for most-used sizes, but you can find more presets if you tap+hold the size, and find the presets field above the keyboard. You can find common paper sizes, screen sizes and even business card sizes. Pro Tip: On canvas, tap+hold a corner of the artboard to move it about - handy for framing your drawing just so, cropping images into an exact size, and getting a reference for how big / small your drawing is based on real-world scale. When you Export, you can choose to capture the image according to the artboard’s sizing. Third on the menu, you can set your Drawing Scale. Select from the shortcuts, or tap+hold on the value fields to choose from other presets or to enter custom values. Tap+hold on the units to change them, as well. Lastly, select the overall Units you prefer to apply them to your workspace. Under the Stylustab, configure settings specific to your stylus. If you’re using the Apple Pencil, you can adjust and enable the pressure response and enable the tilt. 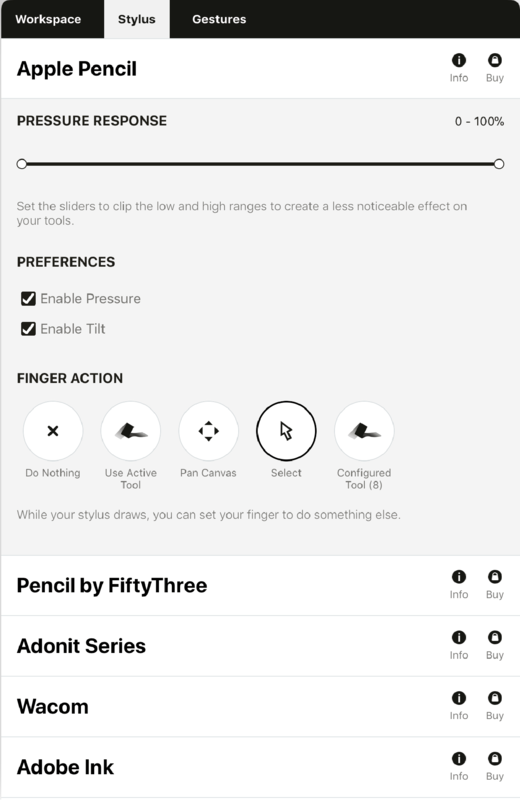 Also choose from five finger actions that function independently from the stylus: Do Nothing, Use Active Tool, Nudge, Pan Canvas, Select, and Configured Tool. If you choose Select, for example, you can use your finger to quickly select in your drawing, and continue drawing with your Apple Pencil. The shortcut buttons on other styli can be configured once the pen has been connected. Buttons can be configured to: No Action, Undo, Redo, Select Last Item, Show Layers, Show Color Wheel, Tool Setup and Show Objects. Read Using a Stylus to learn more about different styli. Under the Gestures tab, you can choose how you want to interact with the app controls. First, find information on one- and two-finger actions. Under One Finger, you’ll also find a checkbox - if checked, this allows touches to display on screen when presenting on another screen via AirPlay. This doesn’t affect the regular use of Concepts on your iPad or iPhone in any way. 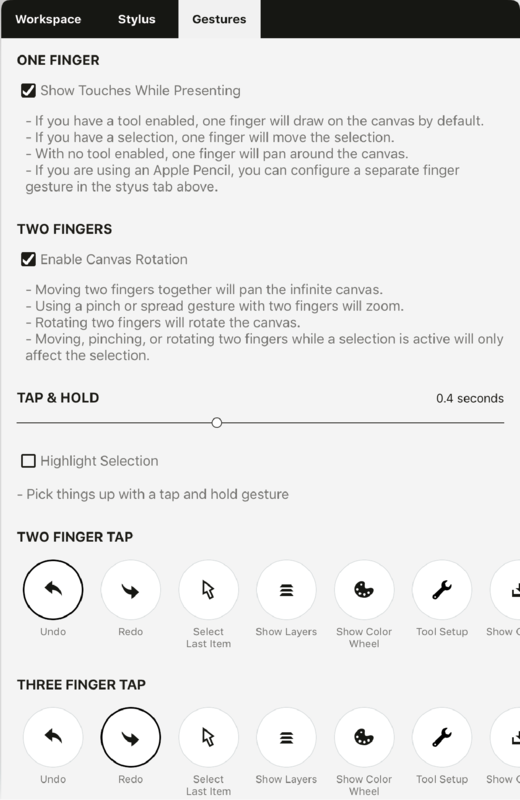 The default setting for Two Fingers is canvas rotation. If you want your canvas to maintain its angle at all times, you can disable canvas rotation by unchecking the second box. If you still need to rotate it every now and then, but don’t want to go back and forth from the menu, you can tap+hold on the degree value in the upper right corner of the status bar to enter the rotation via keyboard. Tap+holddelay can be set according to your preferences. If you’d like tap+hold to react faster, just drag the handle left to make the delay shorter, or if it feels too fast, just drag the handle to the right. Highlight selection. Concepts is set to automatically highlight the selection by graying out everything else. You can disable that here by unchecking the box. Two-finger tap and three-finger tap are wonderfully useful for faster workflow. There are nine options to choose from for each gesture: undo, redo, select last item, show layers, show color wheel, tool setup, show objects, toggle shape guide and toggle interface. Play with these options to find the ones that are most useful for you.